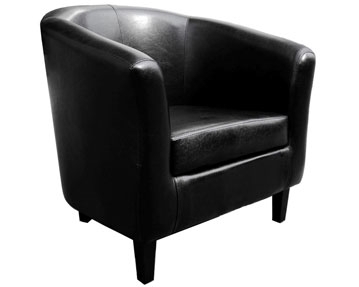 Our leather faced tub chairs are guaranteed to make an attractive addition to your reception area. 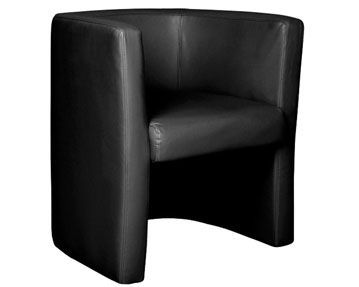 Featuring a contemporary, curved design and plush black leather faced upholstery, these high-quality seats will give the entrance to your office a welcoming, professional look. 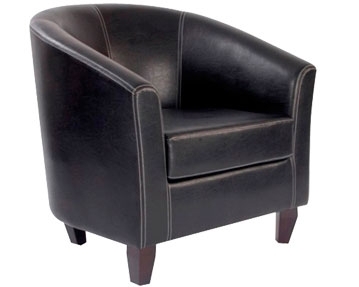 As well as being aesthetically pleasing, our leather tub chairs are extremely comfortable. With a high, contoured back design, supportive armrests and deep, spacious seats, they offer exceptional postural support and a pleasurable seating experience for the user. 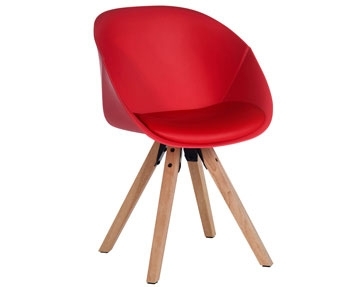 They are also a practical choice as they are made from durable, easy to clean leather and have a robust wooden frame to ensure that they can withstand daily use. Highly versatile, these seating solutions can be used in your reception, break-out spaces and other areas of your workplace. They are also supplied with glides for easy, smooth mobility around the office. Depending on your needs, we offer both a two seat sofa and a single seat armchair. If you want to get further information about our competitively priced reception furniture, why not browse our site to find out more? You can also get in touch with our specialist team here at Furniture At Work for expert advice and guidance.